We had a VAC meeting back in January that was scheduled for the Friday of my first week of school. 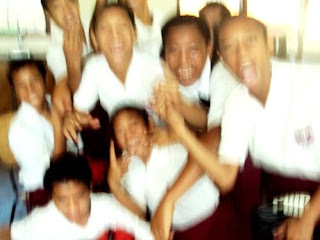 I had to petition my pule even though we were have school cleaning that day. Since then, I’ve missed little to no school. Also, whereas there was a lot going on in Term 1, Term 2 has been laid back and routine. Given my clean attendance record and the smooth sailing of late, I decided missing Wednesday and Thursday would be no big deal. We took the bus down to Saleapaga (Yeah. That’s right, other volunteers. I made my sister take the bus. And she liked it. ), played in the ocean, slept, played in the ocean some more, took the bus back. We stayed in town for a while longer on account of the torrential rain. By the time we got back to my house, it was nearly dark and very wet. 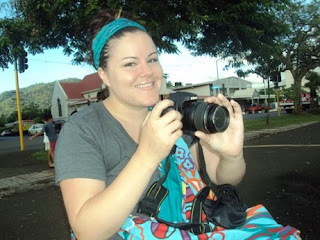 A girl knocked on my door at 5:30 p.m. As it turns out, the National University of Samoa is also about to go on break, and the introductory computer class there had a big assignment due this afternoon. And since kids who graduated from my school had no background in computers, suffice it to say they’re behind in their college class. As it turned out, a slew of them had shown up yesterday to get help from the new computer teacher. My pule referred them to the Indian missionaries, who did their best to help, but the project calls for manipulating some obscure parts of Microsoft Word, so the students were told to wait until I came back today. 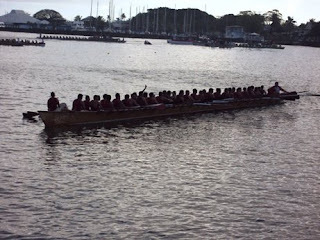 My sister and I woke up at quarter to seven to catch the fautasi races before school began. 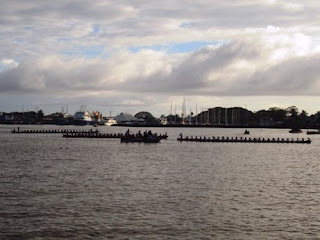 The race itself was anticlimactic, but it’s pretty cool to see all the guys in the boat rowing in sync. Also neat to see the crowd congregating around the entire perimeter of the harbour. 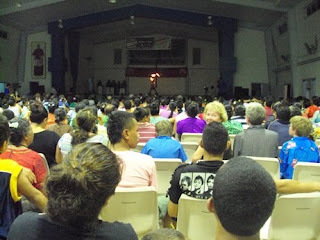 It’s rare to see so many people gathered in one place in Samoa. We had a sports day scheduled for school, so staff and students were in no rush to arrive. And once sports day finally got off the ground, there still wasn’t much going on. They needed music, so I lent them my iPod (They wanted Akon, but settled for Billy Joel. Potayto: potawto, right?). And I was just about to watch volleyball when I’m approached by an NUS girl in tears. Maengi also told me that one of our rugby teams had won some tournament and had tried to deliver celebratory pizza to my house Wednesday night. Oh! And the secretary’s computer broke down yesterday (I am not able to fix the problem, but I am practiced in giving it the “magic touch” that allows it to precariously function for the day.). My skills were needed AND there was free pizza the one day I decide to miss school. Ugh. Better luck next time. We finished the NUS projects with an hour or two to spare, and I’m willing to bet there is pizza in my future this weekend. So it’s cool. The seawall this morning. People along it all the way around. Siva afi, fire dance, at Tuutuuileloloto Hall. Part of the Teuila Festival. 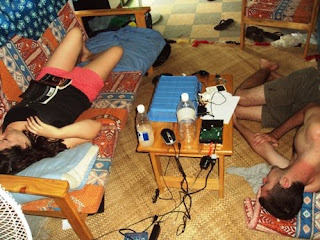 Amanda and Phil crashing in my front room this afternoon. I have your blog on my wikispace as a wonderful sample of using tags. I still pop in a couple of times each week to faitatala on what you are up to. 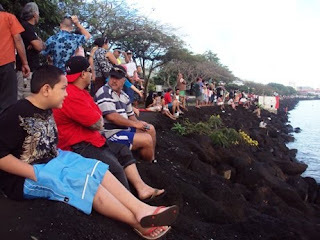 Say talofa lava to your students. Tell them to study hard with you. 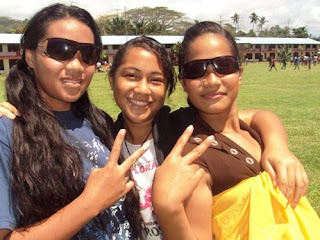 This is a Samoan ICT teacher giving her advise. :) I hope Amanda has a wonderful time with you and I know you will spoil her as much as you can. 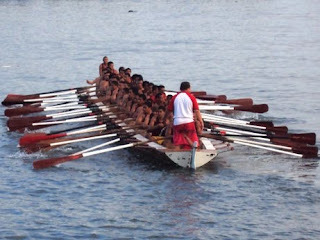 I love seeing the Fautasi racing. i am sending pizza vibes your way for this weekend.